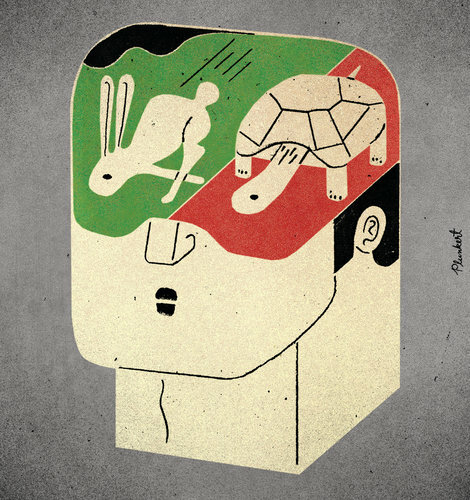 Daniel Kahneman's Thinking Fast and Slow is a book explores the two halves of a persons mind and how they think. The book is a culmination of Kahneman's past work and experiences with his studies and work with his colleagues, a major one being his friend and partner Amos who worked with him on many experiments and is a huge part of the book. The book itself is divided into five sections and is very organized and interactive. The book is constantly making you think and has you do tasks and thinking games that relate to what is being taught in that chapter. I found myself pleasantly surprised when I would try to solve a puzzle and afterwards read how Kahneman would describe all the feelings I was going through while solving the puzzle, how my eyes dilated, my heart rate speeding up, how I made a bit of a face, and how I most likely got the question wrong due to the fast thinking part of my brain making a mistake. which brings us back to the two halves of our brain which is the main focus of the book. Dubbed system 1 (thinking fast) and system 2 (thinking slow), these two systems dictate how we react to certain situations and problems and how we interact and live in our day to day life. System 1 is the passive system that we use naturally and without any effort, such as answering simple questions such as 2 + 2, walking and talking, naming the capital of France, reading facial expressions, and making assumptions. System 2 is the slow thinking part of your mind that requires effort, this system helps you with complicated situations such as answering what 17 X 24 is, driving in rough weather, and hard tasks such as the Add-1 and Add-3 challenges. An example of system 2 in motion would be this video in which the watcher are given the task of counting how passes the white players make with the basketball. During the task, a person dressed as a Guerrilla will walk in the middle of the group for a few seconds and walk out. Chances are that you were so focused on the task that you never saw the Guerrilla. System 2 requires a lot of effort and will likely shut out everything that has nothing to do with the task, making you "blind". A problem with system 2 is that it is lazy and does not work passively and often goes off the assumptions made by system 1, such as the Ball and Bat test. A ball and bat cost $1.10 and the bat costs one dollar more than the ball, how much money is the ball? Most people make the mistake of saying 10 cents for the ball when the right answer is 5 cents. Your system 1 came up with an answer and instead of challenging it, your system 2 endorsed even though it should have picked up the mistake immediately. This book is constantly making your mind work while also discovering how it is working. One of my favorite parts of the book involves conjunction fallacy, which is when a person believes a conjunction of two events is more likely than a single event. In chapter 15, Kahneman and Amos came up with an experiment in which they made up a women named Linda who they described as a bright women who is concerned for social justice and is an active feminist. The experiment gave a list of outcomes for Linda such as being a teacher, a social worker, an active feminist, a bank teller, and a bank teller who is a feminist. 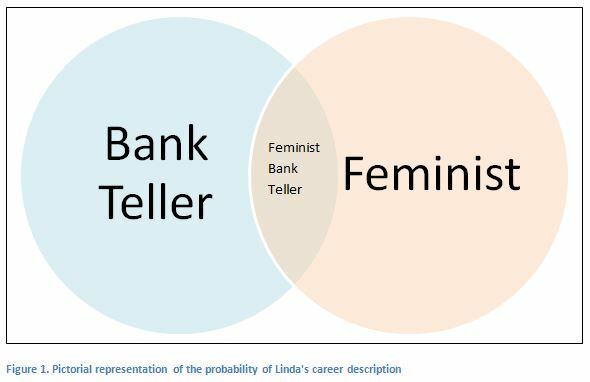 Most people picked the feminist bank teller as more likely outcome than bank teller or feminist. The truth is that bank teller or feminist are more probable than a feminist bank teller as they are only one event while the other is two events. Kahneman and Amos coined the phrase conjunction fallacy as a result of this experiment. People tried to represent their answer to the description of Linda even though it was less probable. This happens all the time in day to day life were people choose answers that make sense rather than answers that are mathematically right. I really liked this experiment as it is something that I am guilty of doing as well, I even initially made the same mistake in the Linda experiment when reading it. I find myself making this mistake a lot of times as I often choose answers or make assumptions base on what makes more sense rather than what is truly right, even when I know something is wrong I still consider it as it makes the most sense in my head. Experiments like this make me realize how simply the wording of a question or a description of a person can radically change the way we think and answer. This book is chalk full of great experiments like this and I'm really glad I chose this book to read as learning about how the mind works is also helping me understand how I work as well.